Mounting, for Tam, is a three cookie event, always! He gets one for positioning, one immediately after I get on (for standing still) and one for acknowledging that I've picked up the reins (he drops his nose without contact). I can leave Tam some distance away. He will stand and watch me walk to the mounting block. As soon as I get up there and turn to look at him, he then comes to the block and sides up to it. How could I NOT give him a cookie each and every time? Thank you Volker. It is about time that people start seeing the difference between collection, natural balance and on the forehand, don't you agree? Love, honors, friendship, respect, are nearly always the reason for the ceremonial giving of food. Food treats really do serve that purpose in the relationship with a horse, plainly. So say Don, Altea, and Bonnie the Wonder Filly. The official training programme laid out by the FN (the German national riding association) is directly derived from the "Reitvorschrift H.Dv.12" ("Heeresdienstvorschrift"), which is a military rulebook for training cavalry horses. It originated in 1882 - last reworked 1937 by the Wehrmacht. ItÂ´s based heavily on Gustav SteinbrechtÂ´s Gymnasium as I understand and - even though always designed as a military rulebook - contains teachings which seem moderate and horse friendly compared to the daily routine seen at sport events nowadays. Dauernden Erfolg wird sie [die Ausbildung] nur haben, wenn alle Vorgesetzten und Untergebenen von der Freude am Reiten und der Liebe zum Pferd beseelt sind. Means: the training will only be successful, if all superiors and subordinates are inspired by delight in riding and love to the horse. Now where do you see that in professional riding - or so many riding schools for that matter? I have found nothing 'friendly' as such in Gustav's work to be honest. There is a lot of good info in there to understand how exercises can benefit the movement of the horse in a better way. So I really recommend it, mind.The prime directive does remain obedience as does in the German rule book, which is full of biomechanical impossibilities and really contradict the old masters. For instance things such as costal flexion, low hands, using hands with continuous strong contact combined with the use of legs simultaneously. What is written and spoken by trainers and what is actually executed is often quite a different story. The problem currently is probably that sports are not so much about the honour of it any more, but about the money. 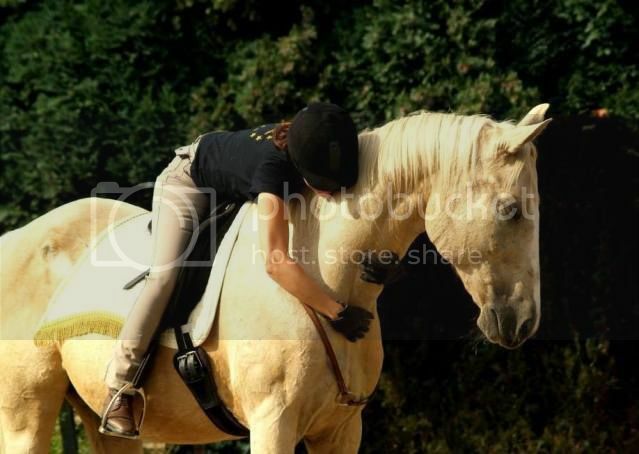 And in addition, love for riding does not automatically mean that the horse will love it too. Josepha, I merged all your single threads with the links to your articles into one big sticky. In this way (1) they are all in one place and thus easier to find and (2) the Theory section does not get all filled up with mini-topics containing just a link. Hope this solution is okay for you? Josepha, donÂ´t get me wrong - I didnÂ´t mean to say that Steinbrecht or the H.Dv.12 is good. IÂ´ve not read either of them, except a few quotes. I just found it remarkable that the modern evolution of it (at least in the German speaking countries) is even worse than the rules set around the World Wars. And it is the rules that FN uses to teach every trainer in the country. In Austria they have a monopoly on education of riding tutors. You donÂ´t get an official title, except when you bow to their rules. I sent the food rewards article to a friend who was, until this week, using clicker training, but then went to a clinic, and has now been thoroughly convinced by the trainer (a reasonably well-known one in Australia) that using food is bad, doesnâ€™t work, and is mucking up her training. Apparently he explained and showed her in depth "how it really works". She and her horses were doing great things and everyone seemed extremely happy with that way of training, so itâ€™s a shame. I hope she will read your article and give it some thought. I like what you wrote about rope halters. I do own some, but I agree with you, they are not a soft and kind alternative. I even used one quite recently. I actually started to think that maybe I was being a bit silly about not using them, because just about everyone else thinks (including very kind people) that they are soft and kind haltersâ€¦ of course, I only needed to come to AND and do a bit of reading to find that Iâ€™m not alone in what I think of them. (Also, I should know better by now than to let what other people do affect my judgement. ) But I donâ€™t like the metal buckles on the nose of most webbing halters either, many have the metal bit sticking out underneath, which can dig into the horseâ€™s nose. I need to find some halters with smooth, soft nosebands. One day, when I can afford it, Iâ€™m going to buy the cavesson you have for sale in your shop â€“ it looks lovely. What is written and spoken by trainers and what is actually executed is often quite a different story. it's clear, packed with what SHOULD be common sense (which some people seem to lack!) and it's absolutely truthful. Thank you so much And I agree according the stable halters also I have leather ones which are so great. But I rarely use them, for having the luck of living with my boys in our own home, they just wander free, or I take them a long with a rope around their neck from point a to point b. Inocencio actually is more easy in hand with neck rope than with halter. Halter makes him in this state of: No don't wanna!! !